Remove the backbone by holding the knife horizontally and cutting with the tip of the blade along the backbone from head to tail. Remove the cut backbone. Wash fish in running water. With the aid of a forcep, pull out the rib bones which have not been cut away. Make a superficial slit along the dent of the dorsal muscles and pull out the intermuscular spines embedded between the muscles from the head to the tail. Soak in 80° Salometer brine for 12 hours Drain off and wash briefly. 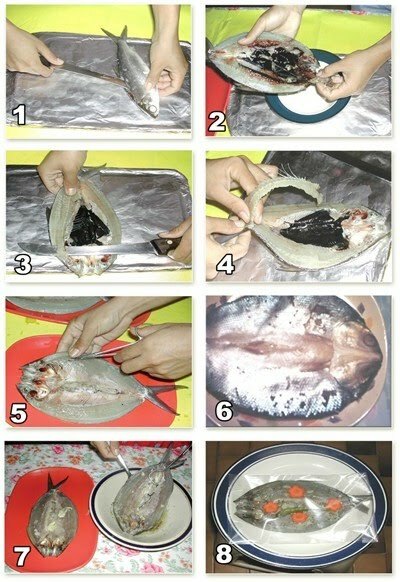 Remove from marinade, drain and pack in plastic bags. To serve, fry and add tomatoes.